The job function of a cashier is to receive and disburse money in establishments other than financial institutions. Cashiers are tasked with processing debit cards and making credit card transactions, either with the general public or during transactions with employees. Experience with a cash register, credit card terminal, or scanner—or related cash or money handling technology—is necessary. Additionally, in some businesses, an auditing mechanism is in place to ensure the integrity of the transactions processed. That said, only candidates with a keen ethical nature are selected for this kind of job. Almost half of all cashiers work part-time. Most cashiers are asked to work weekends, evenings, and holidays. According to Payscale, cashiers in the United States take home an average $9.15 per hour. Compensation ranges from $7.54 per hour on the lower end to $11.79 on the higher end. A cashier in a small operation—like a small grocery store, boutique clothing store, or nail salon—basically functions like a clerk, secretary, or customer service representative. It is important to note that if the responsibility for handling cash or electronic forms of payment is performed in addition to other office duties, then this task must be separate from the person who is responsible for balancing the books. This is necessary in order to maintain good accounting checks and balances. In larger establishments, the role of the cashier is mostly dependent upon the volume of cash and card transactions that must be completed on a daily basis. Separation of duties is also required in this role to maintain good accounting checks and balances. A good example of a medium-sized business is a national car rental outfit. In this case, the cashier is also the person who functions as a receptionist because the cashier is also the greeter as well as the individual responsible for handling the cash and credit card transactions. 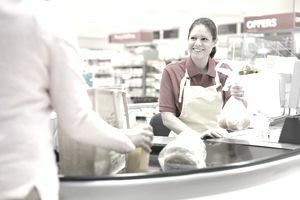 In some cases, the cashier’s role is expanded into a sales role in which a portion of the compensation depends on the sales of a monthly or annual membership. This type of cashier function is typical at membership-based gyms and spas. Establish or identify prices of goods, services, or admission, and tabulate bills using calculators, cash registers, or optical price scanners. Meet with customers to resolve issues. Engage with potential customers and sign up members. In a large office, there is almost always a person that is solely responsible for handling all cash and card transactions. The most logical place to locate this office job is in the business office or accounting department. In a large office, this job is a dedicated function where the volume of the transactions provides cashiers with enough work to justify this role being their only full-time job. An example of a cashier who works in a large business is a cashier employed in a white-shoe law office, major department store, large hotel, or hospital. Cashiers in these kinds of businesses may service in-house lawyers, hotel guests, shoppers, or patients and staff members. These cashier positions are quite different from that of a cashier who scans items in a supermarket—with a lot more responsibility, requiring more math and computer skills. In some sense, a cashier in a global law firm, for example, can function a lot like an accountant. Compile and maintain nonmonetary reports and records. It's worth noting that depending on where you work, you might have other responsibilities in addition to the ones stated. If you're a cashier at a small supermarket, you might be asked to return unwanted items to shelves. If you work at a convenience store, you might have to create money orders.